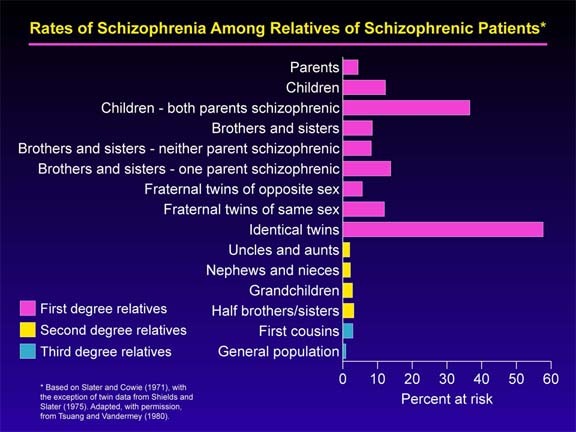 As can be seen from the graph below, schizophrenia definitely has a very significant genetic component. Those who have a third degree relative with schizophrenia are twice as likely to develop schizophrenia as those in the general population. Those with a second degree relative have a several-fold higher incidence of schizophrenia than the general population, and first degree relatives have an incidence of schizophrenia an order of magnitude higher than the general populace. Following are two images that summarize the average risks for developing schizophrenia for different groups of people. (The statistics in the two images vary slightly due to inclusion of different study data). It is of much interest, though, that the correlation of schizophrenia between identical twins, who have identical genomes, is less than one-half. This indicates that schizophrenia is NOT entirely a genetic disease. The current belief is that there are a number of genes that contribute to susceptibility or pathology of schizophrenia, but none exhibit full responsibility for the disease. It is believed that schizophrenia is much like diabetes, which is caused by a number of genetic and environmental factors. Research also increasingly suggests that - like diabetes - many cases of schizophrenia may be preventable. See "Schizophrenia Prevention" for more information. In fact in a September, 2004 presentation Dr. Daniel Weinberger, Director of the Genes, Cognition and Psychosis Program, at the National Institute of Mental Health" stated that he estimated the current number of genes variations linked to schizophrenia was approximately 10. The gene variations that have been identified as being linked to schizophrenia are common in every population - but he believes that it is likely that if a person has a number of these gene variations then the risk of developing schizophrenia begins to rise. The more of these gene variations that a person has, the greater the risk of developing schizophrenia. For example, in 2002 researchers led by NIMHs Dr. Daniel Weinberger linked a gene on chromosome 22 to a near-doubled risk of schizophrenia. When the gene, called COMT, is abnormal, it effectively depletes the frontal lobes of the neurochemical dopamine. That can both unleash hallucinations and impair the brains reality check. Given the constant interplay of genes and environment - the greater the exposure to schizophrenia-linked environmental factors (e.g. lead exposure during pregnancy, birth complications, extremely high stress experiences in life while young, drug use while a teenager, etc.) the greater the likelihood that a person with a given level of genetic predisposition will actually develop schizophrenia. A person with fewer of the gene variants linked with schizophrenia, if exposed to more environmental factors linked with schizophrenia - may pass the threshold for development of schizophrenia just as a person with more gene variants, and lower environmental factor exposure could also pass the threshold to develop schizophrenia. Research is still being done on the risk contribution to the development of schizophrenia that is associated with the different gene variations and environmental impacts. Given that there is clearly some sort of heritable genetic component to schizophrenia, health experts highly recommend that you keep track of your own family's health history (for schizophrenia and other diseases that run in families) with a Health Family Tree, and that you share this information with your doctors. If you have a complex history of illnesses such as schizophrenia in your family tree, you may want to consider speaking with a genetic counselor for family planning advice. A genetic counselor is a trained professional that can explain the genetic components of various diseases, as well as help you predict your approximate risk of developing the disease and/or passing on relevant genes to your offspring. "Knowing your family medical history can help the health professionals you see to determine if you should be offered medical screening that would not normally be conducted," said Robin Bennett, a genetics counselor and manager of the Medical Genetics Clinics at the University of Washington in Seattle. U.S. Surgeon General Richard Carmona and Francis Collins, Director of the National Human Genome Research Institute, have jointly pioneered a free, web-based software program to help people track their family health histories.The program incorporates information (entered by the user) about the occurence of several genetically-based conditions in grandparents, parents, siblings, children, aunts, uncles, and cousins. The outcome is a family tree that shows kin relationships as well as the existence of medical conditions such as heart disease, diabetes, and cancer (indicated by shaded symbols). In addition to these diseases, the user can choose to enter additional information about general patterns of health, psychiatric problems (such as depression or schizophrenia), birth defects, allergies, dental problems, health-related habits such as smoking or substance abuse, and vision/hearing problems. All this information is incorporated into the final family tree. Additional information on the genetics of schizophrenia is given below. 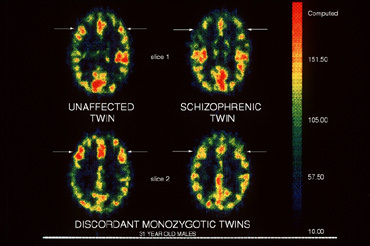 The image above shows PET scan images from a set of monozygotic twins; the ones on the right is from the brain of a schizophrenic twin, the ones on the left from non-schizophrenic twin. These differences clearly indicate non-genetic factors play a role in the pathology of schizophrenia. The image to the left shows an MRI image of unaffected and schizophrenic identical twins. The brain structures pointed out are the ventricles (which are much larger in the person affected by schizophrenia). Eye tracking is the following of moving objects with the eyes. Abnormal eye-tracking is the inability for the eyes to follow moving targets smoothly. People with abnormal eye-tracking follow objects using saccadic or jerky eye movements. This condition is found in over 50% of schizophrenics, as compared to only 8% of the general population. Such a statistic is not surprising, considering the wide-ranging neurological effects of schizophrenia. It is, nonetheless, of particular note that about 45% of schizophrenics’ parents and siblings are also unable to normally perform eye-tracking tasks, indicating a strong genetic basis for schizophrenia. A study which began in 1990, investigating about 20% of the genomes in a large group of families with history of schizophrenia in eastern Quebec, has begun to show clear evidences of the association areas of particular chromosomes with schizophrenia. In particular, chromosomes 11q, 3q, 18q, and 6p have been examined, and the results have shown strong evidence for a schizophrenia susceptibility gene in 6p22-p24 and 11q21-22. Finding the specific gene or genes that lead to schizophrenia has large social implications. The discovery of these genes is the first step towards possible gene therapy. Even if gene therapy is not feasible, the study of gene products can lead to a more detailed biochemical and mechanistic understanding of schizophrenia that may also lead to palliation. If it is known which alleles of which genes cause greater susceptibility to schizophrenia, precautions can be taken, as well, to minimize the chances of developing the disease. Maziade M, et al. American Journal of Medical Genetics. 1997 73 (3) 311-318. Maziade M, et al. American Journal of Medical Genetics. 1997 74 (6) 668-669. Maziade M, et al. American Journal of Medical Genetics. 1995 60 (6) 522-528. The phenomenon of anticipation has been demonstrated in families with history of schizophrenia. Anticipation is defined by increasing severity or earlier age on onset of a disease across successive generations. Diseases such as Huntington’s disease, myotonic dystrophy and fragile X syndrome have all been shown to exhibit anticipation. The genetic explanation of anticipation is generally thought to be the expansion across generation of unstable trinucleotide repeats leading to a pathogenic buildup of gene products. A recent study has demonstrated that anticipation also occurs in schizophrenia. Eight large families (data collected from a total of 186 patients) with a history of schizophrenia were studied. In the first generation, no family members met the diagnostic criteria for schizophrenia; in the second generation , 8 members were affected, and in the third generation, 30 members were affected. A four-point scale was used to assess the mental state of all the family members, with 4 being the most ill. The mean severity of illness was seen to increase across the three generations. A recent study by molecular biologists at UC Irvine isolated a gene, hSKCa3 located on 22q, which leads to an increased risk to schizophrenia. Previous studies have shown this region to be a likely candidate for genes involved with schizophrenia. hSKCa3 codes for an potassium ion channel and acts to dampen the electrical activity and as an "off switch" to signals that are triggered by the NMDA receptors. In addition, the isolated gene also contains a characteristic CAG repeat like the defective huntingin gene that leads to Huntingtons disease. Similar to Huntingtons disease, this poly tri-nucleotide repeat may also lead to anticipation, in which subsequent generations accumulate CAG repeats; this increased poly-glutamine stretch is correlated to earlier onset and worsened states of the disease.